Can you help us find the True Stories of The First Decade? EVE Online's decade of history is unique. It has its heroes, scoundrels, heists and intrigue. But unlike most other games, the most compelling stories were not written by developers and acted out by NPCs. The most interesting stories are those about the real actions of the players that inhabit this universe. In New Eden, we have seen some of the best and some of the worst of what human nature has to offer, when set loose with relative anonymity, scarce resources, complete hypercapitalistic freedom, the ability to organize and to employ mechanized violence on a stellar scale. No one was prepared for the amazing stories that have come out of EVE Online since its launch in 2003. Not the developers, not the players and certainly not those on the periphery that occasionaly read up about yet another stranger-than-fiction news story of the crazy shenaginans in that mysterious game, EVE Online. These stories are sometimes told in late night chats, posted on various forums, mentioned in blogs, lost in fleeting tweets and archived on wikis. Basically, they are scattered around the Internet, often making it hard for someone to get the full picture. 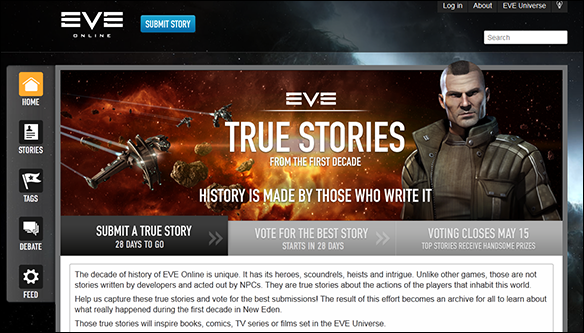 As we at CCP celebrate ten years of EVE Online, we have built a tool for you to write, edit, and discuss these stories, so that there is a place where people can read the history of our Universe, as told by those that inhabit it. Write – Read – Vote! For a given period of time, you can submit stories to the website. During the submission phase, you cannot vote stories up or down. This is to ensure that the first stories don’t get all the votes and attention. During the submission phase, anyone that’s logged in can debate a story. You can add positive or negative debate points, and players can then endorse or oppose those debate points. Debate points are not votes, however, they are simply arguments supporting or opposing the story in its current form. You can revise stories after you submit them, and everyone will see the revision history, like on Wikipedia. After the submission phase ends, on May 1st, voting begins. Voting will run for two weeks, ending May 15th. Voting has both upvoting and downvoting. You can still debate stories and discuss them during the voting period. Once the voting period ends, you can no longer debate stories. The site becomes an archive for all to enjoy. First Place: Round trip for two to Reykjavik, Iceland, including airfare and hotel accomodations. Your trip includes a visit to CCP headquarters to meet senior developers and a ten years subscription of EVE Online. Second Place: Ten years subscription to EVE Online. Third, Fourth and Fifth Place: One year subscription to EVE Online. The Universe of EVE has grown bigger than simply the game of EVE Online. And we intend to make the most of it. As you might suspect, we are looking into publishing more books, comics, and even looking into what it would take to create a film or TV series set in the EVE Universe. That’s where the true stories come in. Having real events, set 20,000 years into the future as inspiration forthe plots and screenplays of those projects is a mind-boggling prospective. Of course, it all depends on the story itself being interesting, but our prospective media partners have shown great interest in adapting or using as inspiration actual events from the game itself. Only active paying accounts can use this website. This is done mostly to keep the spammers at bay, and to ensure that that there is accountability behind the words posted. Do I have to have been there? No, the story you post does not have to be about something you did. It can be about other players, or events that occurred before you started playing. However, be sure to use good references, and mention them in your author notes. What if two people tell the same story? Well, getting two perspectives on the same event can be interesting. There’s nothing bad in that per se. Once the voting starts, one will become more popular. We actually think having multiple accounts from different people on the same events is a positive thing, just like in real life. Different media outlets treat truth, whatever truth is, differently. Can I write about metagaming? Yes, but remember that this is about events that eventually affect the state of things within EVE Online. So if you have a story about IRL seduction and intrigue that ends with a PLEX being stolen in EVE, that makes it a relevant story, however it may be more difficult to adapt than a pure ingame story. Can I write about Dust 514? Sure, if something awesome happened in DUST 514 and EVE, then by all means do so. DUST 514 is part of the EVE Universe. What happens when the contest is done? The site becomes an archive of stories. This is a focused effort to capture the stories from the first decade. There’s a beginning and end to the process, so that we can reward people for the best entries, and to focus the work. If this goes well, we are sure to repeat it. That's it. We look forward to seeing your submissions and to watching the player-written history of a Universe unfold before us.